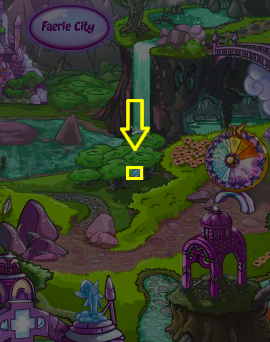 The Discarded Magical Blue Grundo Plushie of Prosperity (or TDMBGPOP for short), is a little blue Grundo plushie located in Faerieland. He first appeared in 2004, but he didn't really have very much to say for himself. Clicking on him he would occasionally say "..." or "0_o" but didn't do much else. Most people believed he was meant to have played a role in the Guildmaster's Dinner logic puzzle, since he appeared at roughly the same time. The theory was that he would act as a source of clues, but the dinner puzzle was cancelled shortly after and so this was never confirmed. After laying there for five years, he got a much-needed makeover during the 2009 Faerie Festival and started giving out Neopoints and items! All alone in the old clouds of Faerieland. In late 2010, he was unavailable because of the Faeries' Ruin plot. After that was over and Faerieland began rebuilding on the ground, we found out what happened to him. Stuck in the trees after Faerieland crashed! You may now visit him once a day for the chance of a prize. Active pet becomes less hungry. Active pet gains an intelligence point. Receive a random number of Neopoints, averaging around 1,500 NP. Receive a random toy, rarity 89 and below. Receive one of the sixteen, exclusive plushies listed below. 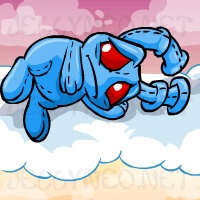 Random when collecting a daily prize at The Discarded Magical Blue Grundo Plushie of Prosperity.